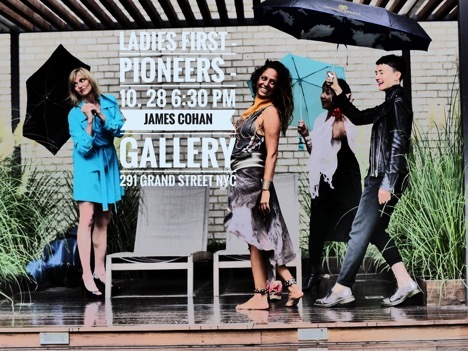 Ladies First–Pioneers celebratesthe accomplishments of female trailblazers. Visionary artists, writers, scientists, social justice fighters, musicians, and others on the vanguard are being presented in a festive four-part event, including reception, award ceremony, concert and after-party. The event is co-hosted by the James Cohan Gallery. Special presentations include a tribute to our friend and mentor, professor Pia Gilbert (1921-2018), and our guest of honor, Valerie Dee Naranjo, of the Saturday Night Live Band, known for her pioneering efforts in West African keyboard percussion music, all in a beautiful visual setting featuring the paintings and drawings of Grace Weaveron her solo exhibition’s final day. Kirin McElwain, Valerie Dee Naranjo, Milica Paranosic and Mioi Takedawill present works by Lynn Bechtold, Johari Mayfield, Gloria Coates, Beatriz Ferreyra,Debra Kaye, Sibyl Kempson, Laurie San Martin, Milica Paranosic, Ann Warren and others. Ladies First, a concert series focusing on women via art was founded by musicians Lynn Bechtold, Milica Paranosic and Keve Wilson in 2012.